Manly beach is a nice beach off the Sydney city limits, reached via Ferry. I paid a short visit on my day of arrival in Sydney, on recommendation from my hosts. The approach to Manly beach was very scenic- like this two giant rocks opening up. If you have the time you can walk till the edge, known as North Edge. Above: An Indian restaurant at Manly beach. Had a samosa here! Below: What all you can do at Manly? below display- right out side the ferry exit, is very useful. 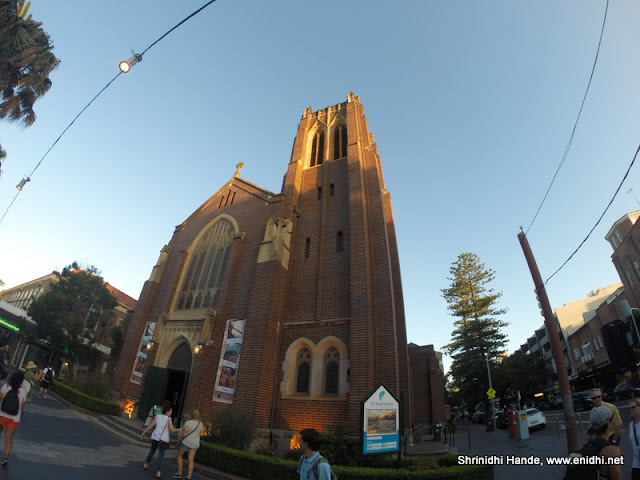 Manly itself can take one full day to explore. I could spend only few hours here. Wonderful captures of the place. The water looks so blue and beautiful! Hi Shrinidhi , Enchanting shades of Blue ... captured in pics n words. I would like to visit Manly beach for Samosa at Ashiana. Not really but that's what I really crave for anywhere out of Mumbai. Looks like there was a lot to do on the beach. The last two pics have lovely light! I really liked that art piece in that square. I don't know why but I just really like industrial art like that. Especially when the kids can climb on and interact with it. Makes it so much more part of the area.